A recent study has confirmed that a large portion of the equipment in athletic and workout facilities are covered in more germs than the typical public restroom. How Germy is Your Gym? The cold and the flu. Athletic facilities and gyms are unique, in that virtually every conceivable surface is considered a high touch point and should be regularly cleaned and sanitized. While that may sound overly burdensome, studies have shown that not doing so will likely reverse the new business out the door, and in a dramatic fashion. As people make their New Year’s resolutions, they are likely looking to join a nearby gym to meet their [...] health goals. The survey results are a clear indicator that gym managers need to improve cleaning practices to encourage repeat business and positive word-of-mouth. As previously mentioned, nearly every viewable surface of a gym or athletic facility should be considered a germ hot spot, with several pieces of commonly used equipment tipping the scale at several times more filthy than the germiest locations in a public restroom. [...] measurements for 27 pieces of equipment commonly found in a workout facility. Among the findings, treadmills have 74 times the bacteria than a water faucet in a public bathroom, and free weights have 362 times more bacteria than a toilet seat. Each of these items were examined and found to be covered in over 1 million colony forming units of bacteria, an estmatied >70% of which are considered harmful to humans. Hot tubs, pools, and saunas. Studies have gone on to conclude that the gym bags and water bottles brought in by patrons were none too clean as well. To maintain the health, performance, and appeal of public gyms and sports facilities, we recommend a two-pronged approach. The first consists of correcting human behavior. Surveys have shown that people have been observed exhibiting socially unacceptable behavior, such as blowing their nose and wiping it on equipment. Hand hygiene is a vital part of socially acceptable and healthy behavior, especially during the cold and flu season. Encourage this behavior, and protect your patrons and business by placing hand sanitizer in easily accessible locations throughout the facility. Additionally, place disinfectant spray near regularly used equipment and request occupants clean off used equipment when their workout is finished. The second involves facility cleanliness and the training and dedication of your custodial staff. According to the same referenced survey, one respondent claimed to have been present in a restroom with a 'brown and yellow' liquid running down the wall from a urinal onto the floor over an extended period, while another stated she saw a janitor apply a used gym towel to clean toilets and the restroom floor. Ensure your janitorial staff is adequately trained in infection control and cross-contamination procedures. Address visible facilities issues immediately to avoid turning away guests, or worse, someone getting sick. Hire a janitorial company that has access to an electrostatic disinfection appliance. 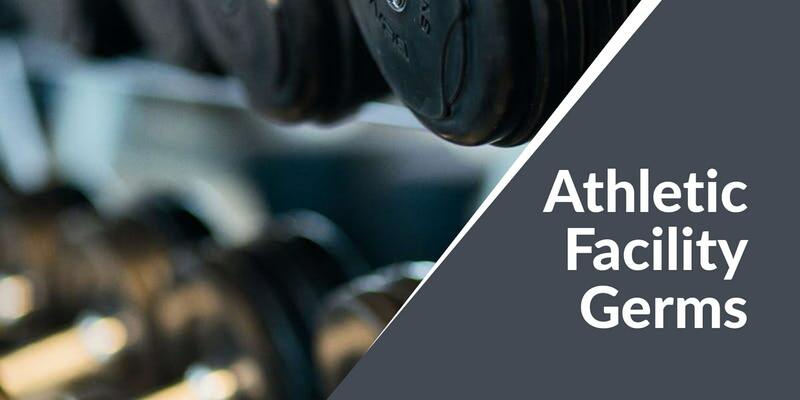 Public gyms and athletic facilities are notoriously gross and likely turn away more business than they attract throughout the year due to occupant concerns regarding hygiene and safety. Fortunately, there are cost-effective solutions that have documented benefits to such businesses and their facilities that can be applied quickly and easily by a trained and dedicated outsourced staff for a fraction of the cost of maintaining a less than motivated in-house cleaning team. If you would like to learn more about the cost-saving and profit-boosting advantages of outsourcing your athletic facility or gym cleaning and infection control services--contact us today for a free quote!